Grease two 9 inch round cake pans, and dust with flour (see TIP). In a medium bowl, sift together the flour, baking powder, baking soda, and salt. In a large bowl, mix the butter until creamy, add sugar, and beat on high speed for 3 minutes. Add cocoa powder, and beat for 1 minute, scraping down the sides to incorporate all into the mixture. Beat in the eggs, one at a time. Beat in the vanilla and Bailey’s Caramel Irish Cream. Mixing at low speed, gradually add in the flour, in 3 portions, alternating it with the warm water, in two portions. Scrape down the sides, mix for 30 seconds. Bake cakes for 50 minutes, on the middle oven rack. Remove cake from the oven, and cool in pans, rested on a trivet or wire rack, for 20 minutes. Remove cake from pans, set it on wire rack and let it cool completely. In a large mixing bowl, whisk at high speed, the egg yolks and egg whites, for 5 minutes, until thick and creamy. In a medium saucepan, combine the water and sugar. Immediately transfer the syrup to a large heatproof liquid measuring cup, and start adding slowly in a thin stream, into the creamy egg mixture, while continuing mixing on a low speed. Once all the sugar syrup has been incorporated into the eggs mixture, beat on medium speed for another 7 minutes, or until the mixture has cooled. In a separate bowl, mix the butter to a creamy mixture (it is easier this way, so that the butter blend better into the frosting, without leaving small butter lumps). Gradually add the soft butter, by couple of tablespoon at a time, into the egg mixture, beating at medium speed after each addition. Once all the butter has been added in, beat at medium speed until the frosting thickens slightly, about 3 minutes. Stir in the salt, and the Bailey’s Caramel Irish Cream, and incorporate evenly. Place the chocolate in a medium bowl. Heat the cream and caramels over medium-low heat, stirring occasionally, until the caramels have melted completely. Pour the hot caramel cream over the chopped chocolate, and stir until all the chocolate melts into a smooth paste. 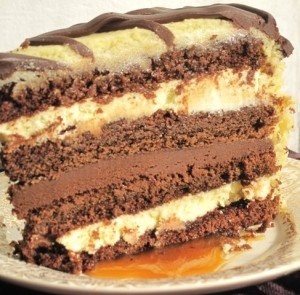 I prepared this cake with 3 layers of filling, as you can see in the above picture, with the ganache in the middle and the Irish cream in the lower and upper layer. Cut each cake horizontally in half, into two even rounds, thus a total of 4 cake rounds. Place the bottom round on a cake plate (I place two pieces of wax paper, on the cake plate, so they meet in the middle of the plate, and can be pulled out from both sides from under the completed cake, so your cake plate stays nice and clean after frosting. I also mixed 1 Tbs of Bailey’s Caramel Irish Cream liquor with 1/2 cup of water, and lightly sprinkled each cake layer before the filling). Spread a nice, thick layer of Bailey’s Caramel Irish Cream frosting on top. Cover with second cake layer. Sprinkle with the above water mixture. Spread the ganache over this layer. (I saved 1/4 cup of the chocolate-caramel ganache for decorating the top of my cake). Top with another cake layer, and repeat the water sprinkling. Spread another layer of the Baily’s Caramel Irish Cream filling. Top off with the last round of the cake. Place the cut part down, and the nice even cake bottom to the top, for easy frosting. Frost the top and sides of the cake with the remaining Bailey’s Caramel Irish Cream frosting. Decorate per your own imagination. (I drizzled store bought caramel ice cream syrup over the plates before serving). Keep the cake refrigerated until ready to serve. TIP: I always dust my cake pans before pouring in the cake batter, to prevent the cake from sticking to the pan, hence easier cake removal after baking. To dust your cake pan, grease your pan, sprinkle about 1 Tbs of flour over the bottom of the pan, lift the pan with two hands, and move it around in a way that the flour spreads evenly over the bottom and sides of the whole pan. Gently shake out any remaining flour.